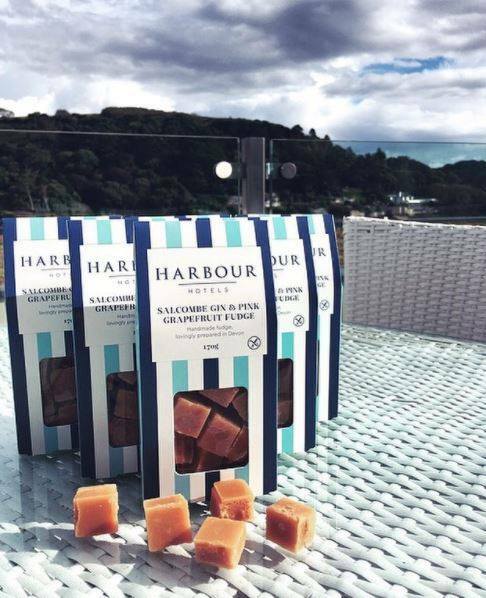 We're delighted to announce our recent collaboration with the Salcombe Harbour Hotel & Spa to create a bespoke, Devonshire inspired flavour that is an exclusive treat to all of their guests. We've teamed up with the fab folk over at Salcombe Gin to create the exclusive Salcombe Gin & Pink Grapefruit Fudge that is honestly, a little taste of heaven! The fudge combines a smooth blend of Salcombe Gin, pink grapefruit, grapefruit oil and grapefruit zest for that sharp kick that will leave you wanting more. The coastal escape that you've been looking for, the Salcombe Harbour Hotel & Spa boasts 50 luxurious bedrooms, all with private balconies and a whole host of little luxuries to enjoy during your stay, including a delicious fudge treat that can be indulged in with a breathtaking view, and the sea breeze in your hair. Devonshire through and through, the Salcombe Gin that is used in this bespoke flavour is distilled and crafted in the heart of Salcombe. Hand crafted in a 450L copper pot, with each batch distilled to produce exceptional gin. With the grapefruit creating a perfect balance of aromas and flavours when teamed with the gin, this bespoke fudge flavour was a no brainer for us! A fantastic Devonshire collaboration, we can vouch for the fact that it tastes great, we just need an excuse for a coastal break away now to indulge in some more! Want your own bespoke fudge flavour made? Take a look at our Corporate Page for more information, and contact us with your enquiry! We'd love to know what you think of this new and bespoke flavour, and if you've had the chance to try it! Keep up to date with us over on Facebook, Twitter, Google + & Instagram for our latest news, lots of delicious fudge and some competitions too!